I make these cookies every year, too!! They are quite a hit. Found the recipe in Southern Living many years ago. cookies = nice. frosting = outstanding. tasty work, lisa! Oh, yum! I can't wait to try these. Making these...check your soda listing: it's listed twice. I'm going to guess it's 1/2 tsp baking powder, and 1/4 teaspoon soda.....yes? I think they're going to be deee-lish. My mom sent me a bag of pecans from Texas and this is what I'm making with them. Does my mom know me or what?! Lelo - Thanks for pointing out the soda listing. I double checked my original, hand written for that 1991 Cookie Swap, only to find I had recopied it as written. Looking through my notes I found that I have been making them with 1/2 teaspoon baking soda and 1/4 teaspoon salt. I've updated the recipe here. Do try them. They really are delicious and will be perfect made with fresh Texas pecans. My friend, Anne, would sometimes share freshly shelled pecans from her parents' yard. I love pecans but I never knew they could taste quite that good. Enjoy! I just made the dough with the soda/powder, no salt option. Crossing my fingers! What a yummy cookie with all that brown sugar icing! Happiest holiday best wishes to you and your family, Lisa. I make these every year -- one of my Christmas favorites, for sure. EXCEPT this year when I baked not a single cookie and my sister took such pity she mailed me shortbread. Good sister! Is the flour all-purpose or self-rising? Rebstarr - For this recipe I use all-purpose flour. Just wondering if anyone has frozen these...I am doing a cookie exchange in November and need cookies that freeze well for Christmas! thanks! Hello. I am making these cookies today. Can you please tell me if the brown sugar is dark or light brown sugar? THANKS! I usually use light brown sugar when making these cookies. That said, I don't think it would be a problem to use dark brown sugar. It would make the taste a little stronger but would not change the texture of the cookies. I have frozen these cookies several times with good results. The cookie holds up better to freezing than the frosting. Ideally, I would freeze the cookies unfrosted and then add the frosting just before serving but I have also frozen them with the frosting on and have not declined to eat them after thawing! Anonymous - Half and half is bought here from the dairy shelf at the supermarket and consists of half cream and half whole milk. I am reading that it has a fat content between 10 and 12%. I don't think it will change the results significantly if you use whole milk or light cream instead. Just add enough to the frosting to achieve a consistency that spreads easily but does not run. I hope that helps! These cookies were very easy to make. My family loved them! These are delicious! I made them today with great results, using dark brown sugar! Jig and Laurie -Thanks for the feedback. I'm glad these cookies turned out well for you. They are truly a personal favorite of mine! These are favorites at our house. I have some in the oven now! 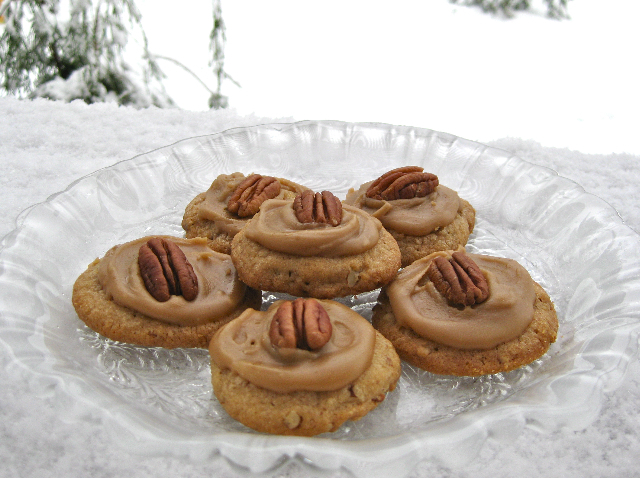 Not only do they have a wonderful, shortbread-nutty flavor, they look great, too. Are they a soft, chewy cookie? I made these today for the first time, they are a yummy soft cookie with a delicious frosting. I made my frosting more like a glaze by adding a bit more cream and stirring after the frosting was off the heat. I then dipped each cookie in to the frosting and added a whole pecan half. There are 5 of us in the house and one guest and they are almost all gone already. This recipe is a keeper. Thanks for sharing it with us. I made these for a cookie exchange. They were delicious and devoured. I drizzled the frosting on top instead of spreading. My Mom and I made these cookies along with tons more cookies and bars. I am a huge fan of pecan parlines anyway, these cookies are SO GOOD!!!! So glad to try this recipe for the first time and we will continue to make them every year! Thank you for the wonderful recipe!